As Smith Wigglesworth explains the role and function of spiritual gifts, he provides important safeguards for the proper exercise of these manifestations of the Holy Spirit. Through his simple yet inspiring words, you will find out how to: deal with evil powers; use your spiritual gifts wisely; minister healing to others; guard against false words of guidance; receive God's wisdom for your life; serve others in Christ's love; and follow the leading of the Holy Spirit. Learn fom Smith Wigglesworth's personal experiences as he ministered to thousands through the power of the Holy Spirit! Smith Wigglesworth on Spiritual Gifts by Smith Wigglesworth was published by Whitaker House in April 1999 and is our 9084th best seller. 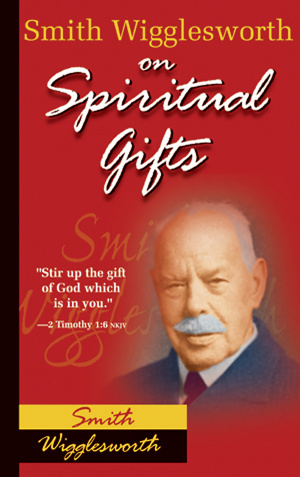 The ISBN for Smith Wigglesworth on Spiritual Gifts is 9780883685334. Be the first to review Smith Wigglesworth on Spiritual Gifts! Got a question? No problem! Just click here to ask us about Smith Wigglesworth on Spiritual Gifts.